Do Students Need Algebra in College? What Is the Purpose of Studying Algebra in College? The article raises the question of the relevance of studying algebra in college. 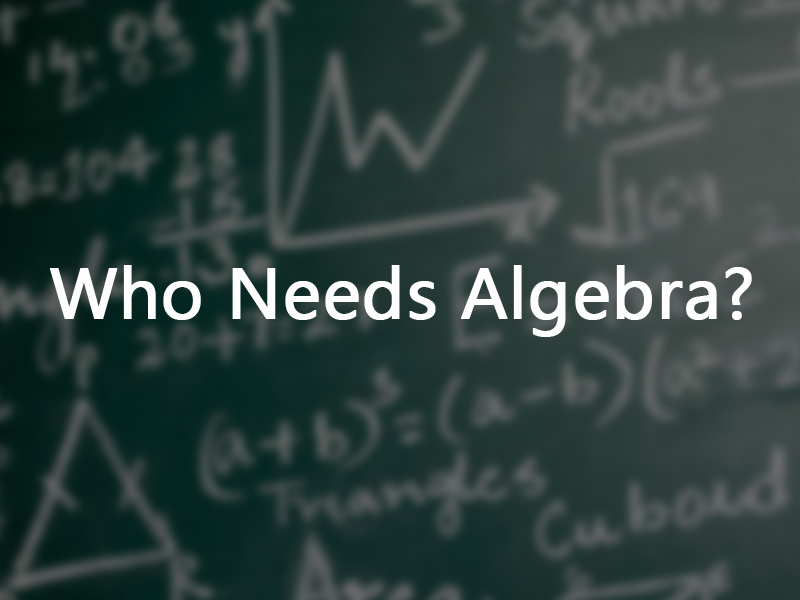 The majority of students find algebra the most daunting and challenging subject in college, as it requires plenty of time and effort. Besides, there is a large number of community college students who are prevented from graduating simply because of failing algebra. Thus, the necessity of this course is in question. Believe it or not, algebra is the most-failed course at every community college in the US. Consequently, a number of educators claim that it is high time to rethink the requirements to algebra in college. Considering the fact that more than half of students who come to college are not prepared for college-level math, the purpose of studying it is questionable. Isn’t it better to give them useful skills instead of torturing them with algebra? What is the purpose of learning remedial math when a student plans on majoring a directly opposite subject? Why can’t a student start on courses that are relevant to the major straightaway? Indeed, if your career has nothing to do with math, then there is no need to study it in college, since it is a waste of both your time and money. Supposedly, every student who has had to deal with math assignments expresses a similar complaint. For this reason, educators are trying a new way to teach math in college. Almost 5,000 American students have already tested a new math program. So far, they find it more engaging and useful. In addition, more students are passing the new courses with flying colors. It is not a secret that the process of learning is more successful when it is applicable to real life, right? Therefore, adults are likely to enjoy the new approach of learning math more than abstract algebraic formulas. Undoubtedly, it is better to learn math concepts that you can apply in your life. The new courses, Statway and Quantway, offer immediate applications in comparison to algebraic equations. Algebra will come in handy only if you plan to compound chemical substances. Engineers also need to study algebra. Others should better study the basics of statistics, levels of risk, and probability. These are the issues that people will certainly face in their real life, for instance, while retirement planning. The Pathways project is a new image of math, because teachers change their approach to teach and students gain more valuable skills. The usage of good study strategies motivates and encourages both educators and students. Our brain is like a muscle, which can get stronger only if you constantly use it in order to develop your skills and abilities. This way, students try to do their best and, consequently, perform better. When a student sees the purpose in studying a course, it becomes easier to succeed and achieve higher results. Due to the Pathways project, many students gain confidence, as they have more choices and deal with appropriate challenges.